﻿﻿﻿﻿﻿﻿﻿﻿Here in New England the cooler fall temperatures have arrived. Sadly, the days of open windows and warm days are gone until spring. For me, the colder it is outside the more time I spend inside reading (or catching up on TV shows). What can I say, I hate the cold weather. When there's snow on the ground I only leave the house when I absolutely have to. Winter is definitely when I make the biggest dent in my TBR list. Curled up with a hot beverage, lounging in sweatpants and an oversized sweatshirt and getting lost in a story. Sounds pretty good to me. 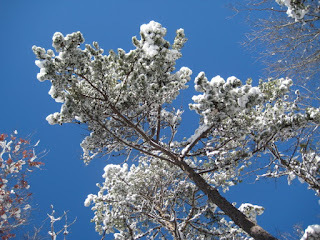 Sometimes the snow can be pretty! During the warm summer months my reading tends to taper off a bit. I try to savor the warm weather because it never feels like it sticks around long enough. I know a lot of people read while at the beach or sitting poolside but I get distracted too easily and can never concentrate on my book for long! What season do you typically find yourself reading the most? I definitely read more at this time of year, mostly because of work. I can read over breakfast or before bed all year round, but I run a bookshop in a tourist town and in winter it gets deadly quiet around here! We take an extra day off every week, which means plenty of time for impromptu 24-hour read-a-thons or shameless pyjama days, plus we get a decent Christmas break to get in lots of 'reading in front of the fire with hot chocolate', PLUS there are hardly any customers around, so we can read most of the working day uninterrupted. In summer I'd be lucky to get five pages read, let alone some quality nose-in-book time! Mum can do it, but I get distracted by all the customers and mobile phones and conversations and kids, so I end up just mucking about online instead. I wasn't really sure,so I went back and checked on my Goodreads quarterly challenge shelves... Apparently there are two times of year that I read most- Winter and Spring. 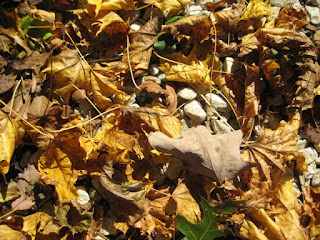 Fall slips away from me, I think, because there is so much to do involving my kids. Tons of stuff going on at school, Fall softball, loads of bookish events and festivals, and cooler weather (very welcome after the sweltering summers here in Atlanta) get me outside more. As we settle back into the school routine, and we get our 2 month break from sports, my reading picks up around November, and I read tons through about mid-February, then I slow down, and pick back up again in April through June when we have almost daily softball (which equals 2-3 hours sitting in the bleachers with nothing to do). Summer is always crazy and just not peaceful enough with three little monsters! Great post. It might actually help me in scheduling my read-for-reviews to be aware of my trends! PS I have a great GIVEAWAY going on right now of a signed copy of Lauren Oliver's new book, The Spindlers. Stop by if you're interested! I read the most in summer. But I'm also still a student which means besides taking a few summer classes, I have a lot of free time. I typically enjoy reading more in the spring/fall when it's nice enough to be able to sit outside in my hammock for hours at a time, but those are also the seasons that I'm the busiest. Winter is usually when I am off of school/work and it feels coziest to read, but my family often travels during that time too so I'm often occupied with other things. I guess I read most during summer - I practically live at the beach during those months and always devour books! It's always so peaceful and relaxing just sitting in the sun, some lemonade and a book. It helps me get through those miserably hot months! I've come to find I'm much more apt to read in the cooler months as well. I try very hard to make outdoor time when the weather is still nice, so when the winter months roll around it's tantalizing to be curled up and snug with a hot mug of chai and a good book. Ahhh. As much as I hate it, that image almost makes me wish for snow right now. My reading habits DEFINITELY pick up in the fall and winter. In the summer, I feel guilty if I stay inside reading. I feel like I need to be out enjoying the sunshine. But I soooo look forward to fall and winter for cozy reading time. I have so many books I want to get through in the next few months. Christmas I don't think you can call it a season but I read most over Christmas because I like to hid away from all the chaos of Christmas.